Not to be confused with Tai languages. Thai,[a] Central Thai (historically Siamese;[b] Thai: ภาษาไทย), is the sole official and national language of Thailand and the first language of the Central Thai people[c] and vast majority of Thai Chinese. It is a member of the Tai group of the Kra–Dai language family. Over half of Thai vocabulary is derived from or borrowed from Pali, Sanskrit, Mon and Old Khmer. It is a tonal and analytic language, similar to Chinese and Vietnamese. Thai has a complex orthography and system of relational markers. Spoken Thai is mutually intelligible with Lao and Isan, fellow Southwestern Tai languages, to a significantly high degree where its speakers are able to effectively communicate each speaking their respective language. These languages are written with slightly different scripts but are linguistically similar and effectively form a dialect continuum. Thai is the official language of Thailand, natively spoken by, according to Ethnologue, over 20 million people (2000). In reality, the number of native Thai speakers is likely to be much higher, since the Thai citizens throughout the central Thailand learn it as their first language while the populations of western and eastern parts of Thailand, which had since ancient time formed the core territory of Siam, also speak central Thai as their first language. Moreover, most Thais in the northern and the northeastern (Isaan) parts of the country today are bilingual speakers of Central Thai and their respective regional dialects due to the fact that (Central) Thai is the language of television, education, news reporting, and all forms of media. A recent research finds that the speakers of Northern Thai language (or Kham Mueang) have become so few, as most people in northern Thailand now invariably speak standard Thai, such that they are now using mostly central Thai words and seasoning their speech only with "kham mueang" accent. Standard Thai is based on Ayutthaya dialect,[d] and register in the educated classes. In addition to Central Thai, Thailand is home to other related Tai languages. Although some linguists classify these dialects as related but distinct languages, there is a high degree of mutual intelligibility between these regional dialects/languages. Nonetheless, it is often claimed that the language policy of the Thai government has shaped the dominant view that these languages are only regional variants or dialects of the "same" Thai language, or as "different kinds of Thai". Ayutthaya dialect (Standard Thai, Outer Bangkok), native spoken in encircle area of Bangkok such as Ayutthaya, Ang Thong, Lopburi, Saraburi, Nakhon Nayok, Nonthaburi, Pathum Thani, Samut Sakhon and Samut Prakan Provinces, Eastern and Northern Bangkok. Although this dialect is standard form and sole use in education system, however this dialect are not public especially in metropolitan area, in media can found on Thai Royal News only. Eastern dialect, spoken in Chanthaburi, Trat, Sa Kaeo, Prachinburi (except Muang Prachinburi, Si Maha Phot, Si Mahosot and Kabin Buri Districts speak Chonburi dialect and Isan), Chachoengsao (except Mueang Paet Riu, Phanom Sarakham, Bang Khla, Ban Pho and Bang Pakong Districts speak Chonburi dialect), part of Chonburi and part of Koh Kong Province of Cambodia. Thonburi dialect (also called Bangkok dialect), spoken in Thonburi side of Bangkok. Have some Portuguese and Persian influences. Vientiane Central Thai, spoken in Tha Bo District and some place in Ratchaburi Province. Very related to Ayutthaya dialect and sometimes can classified as Ayutthaya dialect. Suphanburi dialect, spoken in Suphan Buri, Sing Buri, Nakhon Pathom, part of Samut Songkhram, part of Ratchaburi and some place in Rayong Provinces. This dialect is standard form in Ayutthaya Kingdom, but today remain in Khon only. Kanchanaburi dialect, spoken in Kanchanaburi. Very related to Suphanburi dialect and sometimes can classified as Suphanburi dialect. Krung Thep dialect (also called Phra Nakhon dialect), native spoken in core area of Phra Nakhon side in Bangkok (but not native in Eastern and Northern Bangkok which speak Standard Thai), however this dialect is common use as an entire metropolitan area. Common Media in Thailand use this dialect. Chonburi dialect (called Paet Riu dialect in Chachoengsao Province), spoken in most upper part of Chonburi Province (also in Pattaya), Mueang Paet Riu, Phanom Sarakham, Bang Khla, Ban Pho and Bang Pakong Districts in Chachoengsao, Mueang Prachinburi, Si Maha Phot, Si Mahosot and Kabin Buri Districts in Prachinburi, part of Chanthaburi Provinces, and Aranyaprathet District. Nangrong dialect, spoke by Teochew trader in Nang Rong District. This dialect enclaved by Isan language, Northern Khmer language and Kuy language. Photharam dialect, language enclave in Photharam, Ban Pong and Mueang Ratchaburi districts, but classified as Capital dialect. This dialect enclaved by Ratchburi dialect. Hatyai dialect, spoke by non-Peranakan Chinese origin (particularly Teochews) in Hat Yai District (Peranakans speak Southern Thai language), Very high Teochew and some Southern Thai influences, Southern Thai language called Leang Ka Luang (Thai: แหลงข้าหลวง). This dialect enclaved by Southern Thai language. Bandon dialect, spoke by non-Peranakan Chinese origin (particularly Teochews) in Bandon District, very similar with Hatyai dialect and also enclaved by Southern Thai language. Betong dialect, spoke by non-Peranakan Chinese origin (particularly Cantonese) in Patani area, SomeCantonese and Teochew influences and high Southern Thai and Yawi language influences. This dialect enclaved by Southern Thai language and Yawi language. New Sukhothai dialect, spoken in Sukhothai, Kamphaeng Phet, Phichit and part of Tak Provinces. High Northern Thai influence. Pak Nam Pho dialect, spoken in Nakhon Sawan, Uthai Thani, Chainat, part of Phichit and part of Kamphaeng Phet Provinces. Ratchburi dialect, spoken in Ratchaburi and most area in Samut Songkhram Provinces. Prippri dialect, spoken in Phetchaburi and Prachuap Khiri Khan Provinces (except Thap Sakae, Bang Saphan and Bang Saphan Noi Districts). Isan (Northeastern Thai), the language of the Isan region of Thailand, a collective term for the various Lao dialects spoken in Thailand that show some Central Thai influences, which is written with the Thai script. It is spoken by about 20 million people. Thais from both inside and outside the Isan region often simply call this variant "Lao" when speaking informally. Street or Common Thai (ภาษาพูด, phasa phut, spoken Thai): informal, without polite terms of address, as used between close relatives and friends. Elegant or Formal Thai (ภาษาเขียน, phasa khian, written Thai): official and written version, includes respectful terms of address; used in simplified form in newspapers. Religious Thai: (heavily influenced by Sanskrit and Pāli) used when discussing Buddhism or addressing monks. Most Thais can speak and understand all of these contexts. Street and Elegant Thai are the basis of all conversations. Rhetorical, religious, and royal Thai are taught in schools as the national curriculum. Many scholars believe that the Thai script is derived from the Khmer script. Certainly the numbers were lifted directly from Khmer. The language and its script are closely related to the Lao language and script. Most literate Lao are able to read and understand Thai, as more than half of the Thai vocabulary, grammar, intonation, vowels and so forth are common with the Lao language. It is an abugida script, in which the implicit vowel is a short /a/ in a syllable without final consonant and a short /o/ in a syllable with final consonant. Tone markers, if present, are placed above the final onset consonant of the syllable. Vowels sounding after an initial consonant can be located before, after, above or below the consonant, or in a combination of these positions. There is no universally applied method for transcribing Thai into the Latin alphabet. For example, the name of the main airport is transcribed variously as Suvarnabhumi, Suwannaphum, or Suwunnapoom. Guide books, textbooks and dictionaries may each follow different systems. For this reason, most language courses recommend that learners master the Thai script. Official standards are the Royal Thai General System of Transcription (RTGS), published by the Royal Institute of Thailand, and the almost identical ISO 11940-2 defined by the International Organization for Standardization. The RTGS system is increasingly used in Thailand by central and local governments, especially for road signs. Its main drawbacks are that it does not indicate tone or vowel length. As the system is based on pronunciation, not orthography, reconstruction of Thai spelling from RTGS romanisation is not possible. The ISO published an international standard for the transliteration of Thai into Roman script in September 2003 (ISO 11940). By adding diacritics to the Latin letters, it makes the transcription reversible, making it a true transliteration. Notably, this system is used by Google Translate, although it seems not to appear in many other contexts, such as textbooks and other instructional media. This may be because the particular problems of writing Thai for foreigners, including silent letters and placement of vowel markers, decrease the usefulness of literal transliteration. In each cell below, the first line indicates International Phonetic Alphabet (IPA), the second indicates the Thai characters in initial position (several letters appearing in the same box have identical pronunciation). Note also that ห, one of the two h letters, is also used to help write certain tones (described below). * ฃ and ฅ are no longer used. Thus, modern Thai is said to have 42 consonant letters. ** Initial อ is silent and therefore considered as a glottal stop. Although the overall 44 Thai consonant letters provide 21 sounds in case of initials, the case for finals is different. For finals, only eight sounds, as well as no sound, called mātrā (มาตรา) are used. To demonstrate, at the end of a syllable, บ (/b/) and ด (/d/) are devoiced, becoming pronounced as /p/ and /t/ respectively. Additionally, all plosive sounds are unreleased. Hence, final /p/, /t/, and /k/ sounds are pronounced as [p̚], [t̚], and [k̚] respectively. Of the consonant letters, excluding the disused ฃ and ฅ, six (ฉ ผ ฝ ห อ ฮ) cannot be used as a final and the other 36 are grouped as following. The number of clusters increases when a few more combinations are presented in loanwords such as /tʰr/ (ทร) in อินทรา (/intʰraː/, from Sanskrit indrā) or /fr/ (ฟร) in ฟรี (/friː/, from English free); however, it can be observed that Thai language supports only those in initial position, with either /r/, /l/, or /w/ as the second consonant sound and not more than two sounds at a time. The vowel nuclei of the Thai language are given in the following table. The top entry in every cell is the symbol from the International Phonetic Alphabet, the second entry gives the spelling in the Thai alphabet, where a dash (–) indicates the position of the initial consonant after which the vowel is pronounced. A second dash indicates that a final consonant must follow. The vowels each exist in long-short pairs: these are distinct phonemes forming unrelated words in Thai, but usually transliterated the same: เขา (khao) means "he" or "she", while ขาว (khao) means "white". There are five phonemic tones: mid, low, falling, high, and rising, sometimes referred to in older reference works as rectus, gravis, circumflexus, altus, and demissus, respectively. 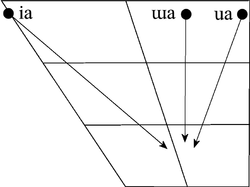 The table shows an example of both the phonemic tones and their phonetic realization, in the IPA. The full complement of tones exists only in so-called "live syllables", those that end in a long vowel or a sonorant (/m/, /n/, /ŋ/, /j/, /w/). For "dead syllables", those that end in a plosive (/p/, /t/, /k/) or in a short vowel, only three tonal distinctions are possible: low, high, and falling. Because syllables analyzed as ending in a short vowel may have a final glottal stop (especially in slower speech), all "dead syllables" are phonetically checked, and have the reduced tonal inventory characteristic of checked syllables. In some English loanwords, closed syllables with long vowel ending in an obstruent sound, have high tone, and closed syllables with short vowel ending in an obstruent sound have falling tone. 1 May be /báːs.kêt.bɔ̄l/ in educated speech. From the perspective of linguistic typology, Thai can be considered to be an analytic language. The word order is subject–verb–object, although the subject is often omitted. Thai pronouns are selected according to the gender and relative status of speaker and audience. There is no morphological distinction between adverbs and adjectives. Many words can be used in either function. They follow the word they modify, which may be a noun, verb, or another adjective or adverb. Comparatives take the form "A X กว่า B" (kwa, [kwàː]), A is more X than B. The superlative is expressed as "A X ที่สุด" (thi sut, [tʰîːsùt]), A is most X. เขาอ้วนกว่าฉัน (khao uan kwa chan, [kʰǎw ʔûən kwàː tɕ͡ʰǎn]) S/he is fatter than me. เขาอ้วนที่สุด (khao uan thi sut, [kʰǎw ʔûən tʰîːsùt]) S/he is the fattest (of all). Because adjectives can be used as complete predicates, many words used to indicate tense in verbs (see Verbs:Tense below) may be used to describe adjectives. ฉันหิว (chan hiu, [tɕ͡ʰǎn hǐw]) I am hungry. ฉันจะหิว (chan cha hiu, [tɕ͡ʰǎn tɕ͡àʔ hǐw]) I will be hungry. ฉันกำลังหิว (chan kamlang hiu, [tɕ͡ʰǎn kamlaŋ hǐw]) I am hungry right now. ฉันหิวแล้ว (chan hiu laeo, [tɕ͡ʰǎn hǐw lɛ́ːw]) I am already hungry. Remark ฉันหิวแล้ว mostly means "I am hungry right now" because normally, แล้ว ([lɛ́ːw]) marks the change of a state, but แล้ว has many other uses as well. For example, in the sentence, แล้วเธอจะไปไหน ([lɛ́ːw tʰɤː tɕ͡àʔ paj nǎj]): So where are you going?, แล้ว ([lɛ́ːw]) is used as a discourse particle. Verbs do not inflect. They do not change with person, tense, voice, mood, or number; nor are there any participles. ฉันตีเขา (chan ti khao, [t͡ɕʰǎn tiː kʰǎw]), I hit him. เขาตีฉัน (khao ti chan, [kʰǎw tiː t͡ɕʰǎn]), He hit me. เขาถูกตี (khao thuk ti, [kʰǎw tʰùːk tiː]), He is hit. This describes an action that is out of the receiver's control and, thus, conveys suffering. เขาจะได้ไปเที่ยวเมืองลาว (khao cha dai pai thiao mueang lao, [kʰǎw t͡ɕaʔ dâj paj tʰîow mɯːəŋ laːw]), He gets to visit Laos. Note, dai ([dâj] and [dâːj]), though both spelled ได้, convey two separate meanings. The short vowel dai ([dâj]) conveys an opportunity has arisen and is placed before the verb. The long vowel dai ([dâːj]) is placed after the verb and conveys the idea that one has been given permission or one has the ability to do something. Also see the past tense below. Negation is indicated by placing ไม่ (mai,[mâj] not) before the verb. เขาไม่ตี, (khao mai ti) He is not hitting. or He doesn't hit. Tense is conveyed by tense markers before or after the verb. เขากำลังวิ่งอยู่ (khao kamlang wing yu, [kʰǎw kamlaŋ wîŋ jùː]), He is running. เขาจะวิ่ง (khao cha wing, [kʰǎw t͡ɕaʔ wîŋ]), He will run or He is going to run. เขาได้กิน (khao dai kin, [kʰǎw dâːj kin]), He ate. เขากินแล้ว (khao kin laeo, [kʰǎw kin lɛ́ːw], He has eaten. เขาได้กินแล้ว (khao dai kin laeo, [kʰǎw dâːj kin lɛ́ːw]), He's already eaten. Tense markers are not required. ฉันกินที่นั่น (chan kin thinan, [t͡ɕʰǎn kin tʰîːnân]), I eat there. ฉันกินที่นั่นเมื่อวาน (chan kin thinan mueawan), I ate there yesterday. ฉันกินที่นั่นพรุ่งนี้ (chan kin thinan phrungni), I'll eat there tomorrow. Thai exhibits serial verb constructions, where verbs are strung together. Some word combinations are common and may be considered set phrases. Nouns are uninflected and have no gender; there are no articles. Nouns are neither singular nor plural. Some specific nouns are reduplicated to form collectives: เด็ก (dek, child) is often repeated as เด็ก ๆ (dek dek) to refer to a group of children. The word พวก (phuak, [pʰûak]) may be used as a prefix of a noun or pronoun as a collective to pluralize or emphasise the following word. (พวกผม, phuak phom, [pʰûak pʰǒm], we, masculine; พวกเรา phuak rao, [pʰûak raw], emphasised we; พวกหมา phuak ma, (the) dogs). Plurals are expressed by adding classifiers, used as measure words (ลักษณนาม), in the form of noun-number-classifier (ครูห้าคน, "teacher five person" for "five teachers"). While in English, such classifiers are usually absent ("four chairs") or optional ("two bottles of beer" or "two beers"), a classifier is almost always used in Thai (hence "chair four item" and "beer two bottle"). The reflexive pronoun is ตัวเอง (tua eng), which can mean any of: myself, yourself, ourselves, himself, herself, themselves. This can be mixed with another pronoun to create an intensive pronoun, such as ตัวผมเอง (tua phom eng, lit: I myself) or ตัวคุณเอง (tua khun eng, lit: you yourself). Thai also does not have a separate possessive pronoun. Instead, possession is indicated by the particle ของ (khong). For example, "my mother" is แม่ของผม (mae khong phom, lit: mother of I). This particle is often implicit, so the phrase is shortened to แม่ผม (mae phom). Plural pronouns can be easily constructed by adding the word พวก (puak) in front of a singular pronoun as in พวกเขา (puak khao) meaning they or พวกเธอ (puak thoe) meaning the plural sense of you. The only exception to this is เรา (rao), which can be used as singular (informal) or plural, but can also be used in the form of พวกเรา (puak rao), which is only plural. "ผม เรา ฉัน ดิฉัน หนู กู ข้า กระผม ข้าพเจ้า กระหม่อม อาตมา กัน ข้าน้อย ข้าพระพุทธเจ้า อั๊ว เขา" all translate to "I", but each expresses a different gender, age, politeness, status, or relationship between speaker and listener. เรา (rao) can be first person (I), second person (you), or both (we), depending on the context. Children or younger female could use or being referred by word หนู (nu) when talking with older person. The word หนู could be both feminine first person (I) and feminine second person (you) and also neuter first and neuter second person for children. The second person pronoun เธอ (thoe) (lit: you) is semi-feminine. It is used only when the speaker or the listener (or both) are female. Males usually don't address each other by this pronoun. Both คุณ (khun) and เธอ (thoe) are polite neuter second person pronouns. However, คุณเธอ (khun thoe) is a feminine derogative third person. Instead of a second person pronoun such as "คุณ" (you), it is much more common for unrelated strangers to call each other "พี่ น้อง ลุง ป้า น้า อา ตา ยาย" (brother/sister/aunt/uncle/granny). To express deference, the second person pronoun is sometimes replaced by a profession, similar to how, in English, presiding judges are always addressed as "your honor" rather than "you". In Thai, students always address their teachers by "ครู" or "คุณครู" or "อาจารย์" (each means "teacher") rather than คุณ (you). Teachers, monks, and doctors are almost always addressed this way. The particles are often untranslatable words added to the end of a sentence to indicate respect, a request, encouragement or other moods (similar to the use of intonation in English), as well as varying the level of formality. They are not used in elegant (written) Thai. The most common particles indicating respect are ครับ (khrap, [kʰráp], with a high tone) when the speaker is male, and ค่ะ (kha, [kʰâ], with a falling tone) when the speaker is female; these can also be used to indicate an affirmative, though the ค่ะ (falling tone) is changed to a คะ (high tone). รับประทาน /ráp.pra.tʰāːn/ formal, polite Often shortened to ทาน /tʰāːn/. Thailand also uses the distinctive Thai six-hour clock in addition to the 24-hour clock. Other than compound words and words of foreign origin, most words are monosyllabic. Chinese-language influence was strong until the 13th century when the use of Chinese characters was abandoned, and replaced by Sanskrit and Pali scripts. However, the vocabulary of Thai retains many words borrowed from Middle Chinese. Later most vocabulary was borrowed from Sanskrit and Pāli; Buddhist terminology is particularly indebted to these. Indic words have a more formal register, and may be compared to Latin and French borrowings in English. Old Khmer has also contributed its share, especially in regard to royal court terminology. Since the beginning of the 20th century, however, the English language has had the greatest influence, especially for scientific, technical, international, and other modern terms. Many Teochew Chinese words are also used, some replacing existing Thai words (for example, the names of basic numbers; see also Sino-Xenic). From Middle Chinese or Teochew Chinese. The Portuguese were the first Western-nation to arrive in what is modern-day Thailand in the 16th century during the Ayutthaya period. Its influence in trade, especially weaponry, allowed them to establish a community just outside the capital and practice their faith, as well as exposing and converting the locals to Christianity. Thus, Portuguese words involving trade and religion were introduced and used by the locals. Thai has undergone various historical sound changes. Some of the most significant changes, at least in terms of consonants and tones, occurred between Old Thai spoken when the language was first written and Thai of present, reflected in the orthography. Old Thai had a three-way tone distinction on live syllables (those not ending in a stop), with no possible distinction on dead syllables (those ending in a stop, i.e. either /p/, /t/, /k/ or the glottal stop which automatically closes syllables otherwise ending in a short vowel). There was a two-way voiced vs. voiceless distinction among all fricative and sonorant consonants, and up to a four-way distinction among stops and affricates. 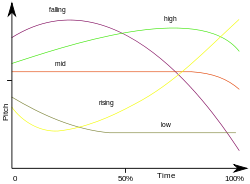 The maximal four-way occurred in labials (/p pʰ b ʔb/) and dentals (/t tʰ d ʔd/); the three-way distinction among velars (/k kʰ ɡ/) and palatals (/tɕ tɕʰ dʑ/), with the glottalized member of each set apparently missing. However, in the process of these mergers the former distinction of voice was transferred into a new set of tonal distinctions. In essence, every tone in Old Thai split into two new tones, with a lower-pitched tone corresponding to a syllable that formerly began with a voiced consonant, and a higher-pitched tone corresponding to a syllable that formerly began with a voiceless consonant (including glottalized stops). An additional complication is that formerly voiceless unaspirated stops/affricates (original /p t k tɕ ʔb ʔd/) also caused original tone 1 to lower, but had no such effect on original tones 2 or 3. Early Old Thai also apparently had velar fricatives /x ɣ/ as distinct phonemes. These were represented by the now-obsolete letters ฃ kho khuat and ฅ kho khon, respectively. During the Old Thai period, these sounds merged into the corresponding stops /kʰ ɡ/, and as a result the use of these letters became unstable. At some point in the history of Thai, a palatal nasal phoneme /ɲ/ also existed, inherited from Proto-Tai. A letter ญ yo ying also exists, which is used to represent a palatal nasal in words borrowed from Sanskrit and Pali, and is currently pronounced /j/ at the beginning of a syllable but /n/ at the end of a syllable. Most native Thai words that are reconstructed as beginning with /ɲ/ are also pronounced /j/ in modern Thai, but generally spelled with ย yo yak, which consistently represents /j/. This suggests that /ɲ/ > /j/ in native words occurred in the pre-literary period. It is unclear whether Sanskrit and Pali words beginning with /ɲ/ were borrowed directly with a /j/, or whether a /ɲ/ was re-introduced, followed by a second change /ɲ/ > /j/. Proto-Tai also had a glottalized palatal sound, reconstructed as /ʔj/ in Li Fang-Kuei (1977[full citation needed]). Corresponding Thai words are generally spelled หย, which implies an Old Thai pronunciation of /hj/ (or /j̊/), but a few such words are spelled อย, which implies a pronunciation of /ʔj/ and suggests that the glottalization may have persisted through to the early literary period. In closed syllables, the long high vowels /iː ɯː uː/ are rare, and cases that do exist typically have diphthongs in other Tai languages. In closed syllables, both short and long mid /e eː o oː/ and low /ɛ ɛː ɔ ɔː/ do occur. However, generally, only words with short /e o/ and long /ɛː ɔː/ are reconstructible back to Proto-Tai. Both of the mid back unrounded vowels /ɤ ɤː/ are rare, and words with such sounds generally cannot be reconstructed back to Proto-Tai. Furthermore, the vowel that corresponds to short Thai /a/ has a different and often higher quality in many of the Tai languages compared with the vowel corresponding to Thai /aː/. Proto-Tai had a system of nine pure vowels with no length distinction, and possessing approximately the same qualities as in modern Thai: high /i ɯ u/, mid /e ɤ o/, low /ɛ a ɔ/. All Proto-Tai vowels were lengthened in open syllables, and low vowels were also lengthened in closed syllables. Modern Thai largely preserved the original lengths and qualities, but lowered /ɤ/ to /a/, which became short /a/ in closed syllables and created a phonemic length distinction /a aː/. Eventually, length in all other vowels became phonemic as well and a new /ɤ/ (both short and long) was introduced, through a combination of borrowing and sound change. Li believes that the development of long /iː ɯː uː/ from diphthongs, and the lowering of /ɤ/ to /a/ to create a length distinction /a aː/, had occurred by the time of Proto-Southwestern-Tai, but the other missing modern Thai vowels had not yet developed. Note that not all researchers agree with Li. Pittayaporn (2009[full citation needed]), for example, reconstructs a similar system for Proto-Southwestern-Tai, but believes that there was also a mid back unrounded vowel /ə/ (which he describes as /ɤ/), occurring only before final velar /k ŋ/. He also seems to believe that the Proto-Southwestern-Tai vowel length distinctions can be reconstructed back to similar distinctions in Proto-Tai. Oh, the fine night, we meet in happiness tonight! I am so shy, ah! I am good at rowing. Rowing slowly across the river, ah! I am so pleased! Dirty though I am, ah! I made acquaintance with your highness the Prince. to hide heart forever, constantly to yearn ptl. Hidden forever in my heart, ah! is my adoration and longing. Map of the Chinese plain at the start of the Warring States Period in the 5th century BC, showing the locations of the states of Yue and Wu. "The Wú say yī for 'good' and huăn for 'way', i.e. in their titles they follow the central kingdoms, but in their names they follow their own lords." "The Middle mountains of Gū are the mountains of the Yuè's bronze office, the Yuè people call them 'Bronze gū[gū]dú'." "... The Yuè people call a boat xūlú. ('beard' & 'cottage')"
^ Although "Thai" and "Central Thai" has become more common, the older term "Siamese" is still used by linguists, especially to distinguish it from other Tai languages (Diller 2008:6[full citation needed]). "Proto-Thai", for example, is the ancestor of all of Southwestern Tai, not just of Siamese (Rischel 1998[full citation needed]). ^ Occasionally referred to as the "Central Thai people" in linguistics and anthropology to avoid confusion. ^ These dialect oftentimes viewed as Krung Thep dialect by outsider. ^ The glottalized stops /ʔb ʔd/ were unaffected, as they were treated in every respect like voiceless unaspirated stops due to the initial glottal stop. These stops are often described in the modern language as phonemically plain stops /b d/, but the glottalization is still commonly heard. 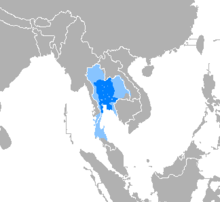 ^ Modern Lao and northern Thai dialects are often described as having six tones, but these are not necessarily due to preservation of the original six tones resulting from the tone split. For example, in standard Lao, both the high and low variants of Old Thai tone 2 merged; however, the mid-class variant of tone 1 became pronounced differently from either the high-class or low-class variants, and all three eventually became phonemic due to further changes, e.g. /kr/ > /kʰ/. For similar reasons, Lao has developed more than two tonal distinctions in "dead" syllables. ^ The upper row represents the original text, the next row the Old Chinese pronunciation, the third a transcription of written Thai, and the fourth line English glosses. Finally, there is Zhengzhang's English translation. ^ Hammarström, Harald; Forkel, Robert; Haspelmath, Martin, eds. (2017). "Thai". Glottolog 3.0. Jena, Germany: Max Planck Institute for the Science of Human History. ^ Peansiri Vongvipanond (Summer 1994). "Linguistic Perspectives of Thai Culture". paper presented to a workshop of teachers of social science. University of New Orleans. p. 2. Retrieved 26 April 2011. The dialect one hears on radio and television is the Bangkok dialect, considered the standard dialect. ^ "The Languages spoken in Thailand". Studycountry. Retrieved 2017-12-26. ^ Martin Haspelmath, Uri Tadmor Loanwords in the World's Languages: A Comparative Handbook 2009 -- Page 611 "Thai is of special interest to lexical borrowing for various reasons. The copious borrowing of basic vocabulary from Middle Chinese and later from Khmer indicates that, given the right sociolinguistic context, such vocabulary is not at all immune ..."
^ Harald Haarmann Language in Ethnicity: A View of Basic Ecological Relations 1986- Page 165 "In Thailand, for instance, where the Chinese influence was strong until the Middle Ages, Chinese characters were abandoned in written Thai in the course of the thirteenth century." ^ Paul A. Leppert Doing Business With Thailand -1992 Page 13 "At an early time the Thais used Chinese characters. But, under the influence of Indian traders and monks, they soon dropped Chinese characters in favor of Sanskrit and Pali scripts." ^ Edmondson 2007, p. 16. ^ Zhengzhang 1991, pp. 159–168. ^ Holm 2013, pp. 784-785. Gandour, Jack, Tumtavitikul, Apiluck and Satthamnuwong, Nakarin. 1999. "Effects of Speaking Rate on the Thai Tones." Phonetica 56, pp. 123–134. Tumtavitikul, Apiluck, 1998. "The Metrical Structure of Thai in a Non-Linear Perspective". Papers presented to the Fourth Annual Meeting of the Southeast Asian Linguistics Society 1994, pp. 53–71. Udom Warotamasikkhadit and Thanyarat Panakul, eds. Temple, Arizona: Program for Southeast Asian Studies, Arizona State University. Apiluck Tumtavitikul. 1997. "The Reflection on the X′ category in Thai". Mon–Khmer Studies XXVII, pp. 307–316. อภิลักษณ์ ธรรมทวีธิกุล. 2539. "ข้อคิดเกี่ยวกับหน่วยวากยสัมพันธ์ในภาษาไทย" วารสารมนุษยศาสตร์วิชาการ. 4.57-66. Tumtavitikul, Appi. 1995. "Tonal Movements in Thai". The Proceedings of the XIIIth International Congress of Phonetic Sciences, Vol. I, pp. 188–121. Stockholm: Royal Institute of Technology and Stockholm University. Tumtavitikul, Apiluck. 1994. "Thai Contour Tones". Current Issues in Sino-Tibetan Linguistics, pp. 869–875. Hajime Kitamura et al., eds, Ozaka: The Organization Committee of the 26th Sino-Tibetan Languages and Linguistics, National Museum of Ethnology. Tumtavitikul, Apiluck. 1993. "FO – Induced VOT Variants in Thai". Journal of Languages and Linguistics, 12.1.34 – 56. Tumtavitikul, Apiluck. 1993. "Perhaps, the Tones are in the Consonants?" Mon–Khmer Studies XXIII, pp. 11–41. Smyth, David (2002). Thai: An Essential Grammar, first edition. London: Routledge. Smyth, David (2014). Thai: An Essential Grammar, second edition. London: Routledge. Edmondson, Jerold A. (2007). "The power of language over the past: Tai settlement and Tai linguistics in southern China and northern Vietnam" (PDF). Studies in Southeast Asian languages and linguistics, Jimmy G. Harris, Somsonge Burusphat and James E. Harris, ed. Bangkok, Thailand: Ek Phim Thai Co. Ltd.: 1–25. Holm, David (2013). Mapping the Old Zhuang Character Script: A Vernacular Writing System from Southern China. BRILL. ISBN 978-9-004-22369-1. Zhengzhang, Shangfang (1991). "Decipherment of Yue-Ren-Ge (Song of the Yue boatman)". Cahiers de Linguistique Asie Orientale. 20 (2): 159–168. Inglis, Douglas. 1999. Lexical conceptual structure of numeral classifiers in Thai-Part 1. Payap Research and Development Institute and The Summer Institute of Linguistics. Payap University. Inglis, Douglas. 2000. Grammatical conceptual structure of numeral classifiers in Thai-Part 2. Payap Research and Development Institute and The Summer Institute of Linguistics. Payap University. Inglis, Douglas. 2003. Conceptual structure of numeral classifiers in Thai. In Eugene E. Casad and Gary B. Palmer (eds.). Cognitive linguistics and non-Indo-European languages. CLR Series 18. nd Gary B. Palmer. Mouton deGruyter. 223-246. Wikivoyage has a phrasebook for Thai. Volubilis Dictionary VOLUBILIS (Romanized Thai - Thai - English - French) : free databases (ods/xlsx) and dictionaries (PDF) - Thai transcription system. Thai books+Audio, a lot of books in Thai with audio. This page was last edited on 24 April 2019, at 21:57 (UTC).